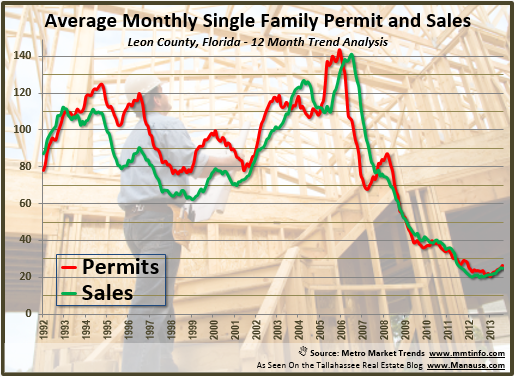 The market for new home sales in Tallahassee has turned, as both new permits and new sales are on the rise. 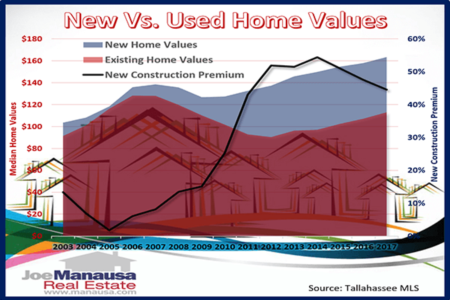 As we look forward to 2014 and what we should expect from development and new home sales, we see a market that is faced with a conundrum of sorts, as the new home sales demand in Tallahassee might just be at a price-point that new home builders cannot profitably operate. In the real estate graph above, the one-year trend of new home permits is plotted in red, while the one-year trend of new home sales is plotted in green. Though it is too early to call a market bottom in 2012, I suspect that will be the case when looking back in years to come. REMINDER: The Weekly Special Real Estate Report was published and disbursed this morning (as it is each and every Monday morning). You can join the thousands of people who receive the report via email by subscribing to it right here). Both new home permits as well as new home sales are on the rise as both trends have moved up from a low of 20 reached last year. Considering both trends had peaked at an average of 140 new home sales (and permits) each month by July of 2006, our current numbers are still incredibly low. 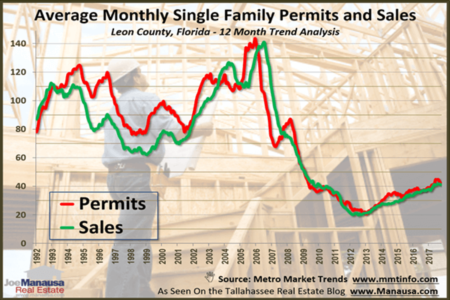 When looking forward to what we should expect for the new home sales market in Tallahassee, one might assume that the rise should continue to at least the 100 units per month rate that we experienced in the 1990s. 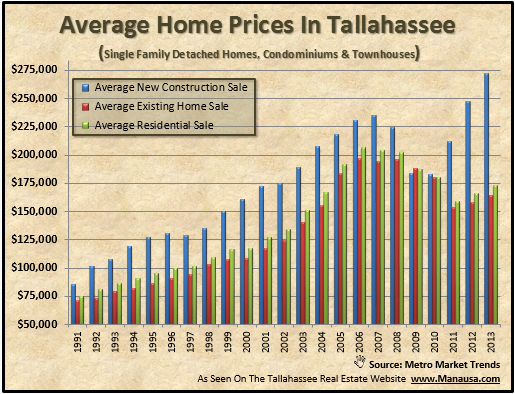 After all, if Tallahassee's growth rate stays consistent with the past, won't we need new home sales to continue at a rate similar as what was experienced prior to the housing market boom? The problem that we might encounter with this assumption relates to the cost of building today. Ask any home builder in Tallahassee about what it costs to build today versus any time in the past, and the answer is "more." That's right, while real estate values declined, the cost to build new homes has risen. 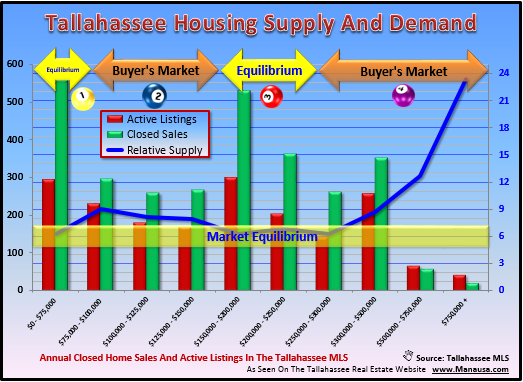 Taking that into account, when we study supply and demand in the Tallahassee real estate market, we find a trend that will lead to a need (demand) for homes priced below $300,000, but a glut of supply for those priced above $300,000. The blue line in the graph above shows that the relative supply of homes priced above $300,000 is sufficient for all demand in the foreseeable future, thus home builders will need to target construction opportunities below that price point. The blue bars show an average new home sales price of $272K, while the average existing home sales price (red bars) is $164K, which means that new homes are being built and sold at prices 66% above the resale market. If you are buying or build a new home in this market, just how long do you think you need to own the home before the resale market will catch up to what you paid? Additionally, how can builders bring product to the market at the prices that will be short of supply first (roughly $125K to $175K)? This is the conundrum that Tallahassee home builders will face ... a demand for what they cannot supply. This demand will help return property values to Tallahassee, but it will take time for the market to balance out. If you want to know more about how new home sales will impact the value of your specific property, just drop me a note and we can schedule a time to evaluate your personal situation and needs. Should You Remodel Your Home To Get It Sold?